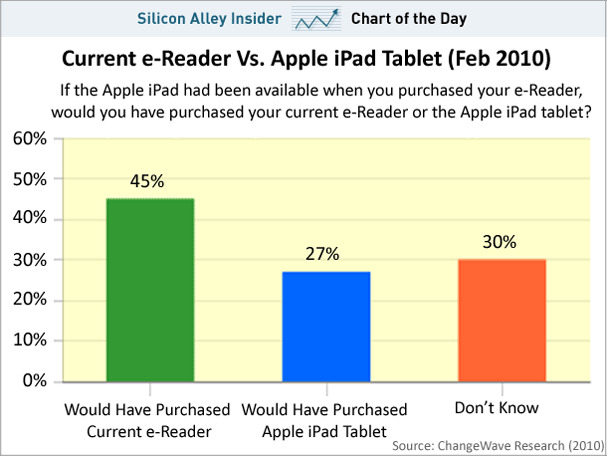 Apple’s iPad isn’t on sale, but it’s already stirring up feelings of envy for people who own rival e-readers like Amazon’s Kindle. Here’s another ugly stat for Amazon from ChangeWave that’s not in this chart. When it asked consumers which e-reader they would buy in the next 90 days, 40% of the people said they want an iPad, while just 28% said they want a Kindle, even despite the Kindle’s significantly lower price tag.